When your stomach hurts, everything you do is that much harder. The pain itself is distracting, as is worry over finding the cause. Acid reflux and ulcers are common ailments that can sometimes be confused, because both cause pain in the stomach area. While ulcers do not cause acid reflux, these conditions sometimes occur together. Doctors rely primarily on your symptoms and tests to diagnose acid reflux versus an ulcer. The causes and treatments for ulcers and acid reflux differ, so an accurate diagnosis is important to determine the best treatment. Your symptoms, the site and character of your discomfort, and symptom timing are important factors your doctor will consider in differentiating acid reflux versus an ulcer. Burning pain behind the breastbone and possibly into the throat that occurs after meals points toward acid reflux. This discomfort often worsens when you lie down or bend over. Ulcer pain is commonly described as gnawing or boring discomfort located toward the bottom of the rib cage. Ulcer pain usually occurs on an empty stomach and is relieved by eating. Unintentional weight loss may point toward an ulcer, whereas difficulty swallowing or a chronic cough makes acid reflux more likely. Your doctor will perform a physical exam to help determine the source of your pain, which could be due to an ulcer, reflux or another problem. Paleness suggests anemia, which may indicate a bleeding ulcer. Yellowish discoloration of your skin, known as jaundice, points toward the liver rather than the stomach or esophagus as the culprit for abdominal pain. A mass felt in the abdomen might indicate a tumor. Mild to moderate tenderness confined to one area of the upper abdomen might indicate an ulcer. Severe, more diffuse abdominal tenderness suggests the possibility of an ulcer that has bored through the wall of the stomach or intestine -- or another serious problem. Your doctor might request laboratory tests to assist with the diagnosis between acid reflux versus an ulcer. The presence of bacteria called Helicobacter pylori -- the usual cause of an ulcer -- can be detected with blood, breath or stool testing. A stool sample may be examined for blood, which could indicate a bleeding ulcer. Blood tests can also determine whether you are anemic, which could indicate ulcer-related blood loss. Blood work also provides your doctor with information regarding kidney and liver function, which may help rule out other potential causes of your pain. Endoscopy typically provides a definitive diagnosis to differentiate between acid reflux disease and an ulcer. The procedure involves passing a thin, flexible tube containing a camera through the mouth into the esophagus, stomach and first part of the small intestine, or duodenum. Your doctor can look for esophageal inflammation or erosion from acid reflux or ulcers -- sores in the wall of the stomach or duodenum. Esophageal manometry may be performed if acid reflux is suspected. The test assesses the function of the esophageal muscles, including the band at the entrance to the stomach that normally prevents reflux. If your diagnosis is unclear, your doctor may recommend pH monitoring to measure esophageal acid levels. Pain from either an ulcer or acid reflux can usually be treated fairly easily if diagnosed before complications develop. However, if you have signs of blood loss -- such as vomiting blood, bloody or tarry stools and/or tiredness -- it is important to see your doctor right away. Intense pain might indicate a perforated ulcer, which is serious and requires emergency medical attention. 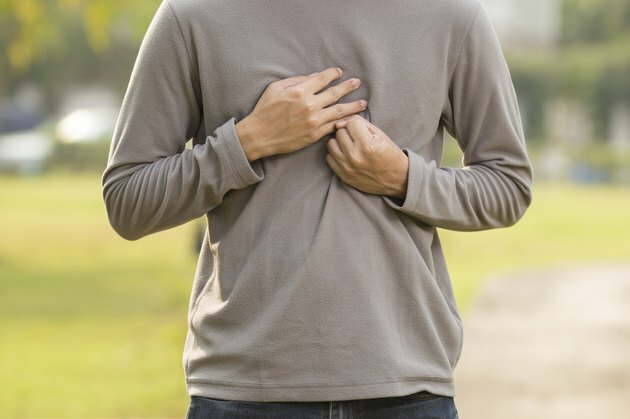 Because the symptoms of reflux or an ulcer are sometimes similar to those of a heart attack, call 911 if you experience unexplained chest pain that radiates into the neck, jaw or arm, especially if the pain is accompanied by shortness of breath, dizziness and/or sweating.